Raspberry Pi at Buckingham Palace #piday #raspberrypi @Raspberry_Pi « Adafruit Industries – Makers, hackers, artists, designers and engineers! 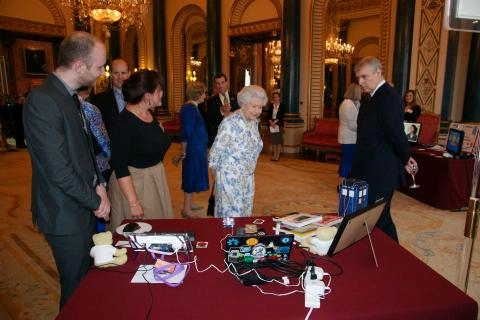 While here in the States, our President is gearing up to attend the first White House Maker Faire, this past week the team at Raspberry Pi Foundation were honored with an invitation to Buckingham Palace to setup a demo stand for the UK Tech Reception! Educational electronics on home workbenches and in school classrooms today are finding their way into the homes of heads of state tomorrow. And as PT and Ladyada mentioned on Ask an Engineer on Wednesday, we might just see Eben getting knighted in celebration of the Raspberry Pi Foundation’s efforts to inspire young engineers all over the world…. Apart from the bit where someone who shall not be named yanked a power cable early, corrupting our Minecraft demo SD card, and apart from the bit where we nearly got shot by an angry close protection officer when we read the map wrong and tried to use the wrong gate, we had a very smooth time of it on Monday, when Craig, Eben and I rocked up at Buckingham Palace at 2pm to set up a demo stand for that evening’s UK Tech Reception. We were told by frowning courtiers that we were not allowed to take any pictures inside – but happily the Palace photographer was there to catch the very surreal moment when I found myself explaining to the Queen what a Raspberry Pi is. Sadly, there was no photographer there for the bit where Prince William waved at us and shouted “Ha! It’s Raspberry Pi!”, but I can tell you now that I don’t expect anything weirder to happen to me all year. You may remember that Prince Andrew came to visit us here at Pi Towers last year. We gave him a Raspberry Pi when he left, and were really chuffed to discover on Monday that he’s been using it; he’s also very well-versed in our charitable mission and our work with teachers and kids. It was very strange, and rather brilliant, to hear him introducing what we do to the Queen, and to talk to him about industrial applications for the Raspberry Pi…. Read More. 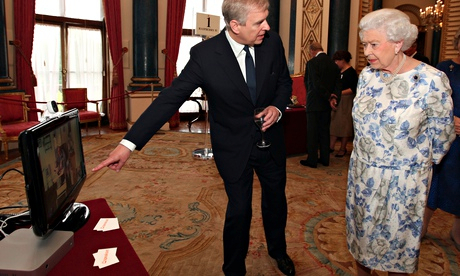 And because I couldn’t resist, check out the photo below of Queen Elizabeth II and the Duke of York peering through the various startup tech gadgets at the UK Tech Reception from The Guardian.